In the final first round matchup in the City of Buffalo FAIL bracket, we have Grassroots Emissary and Byron Brown loyalist, Masten Councilman Demone Smith facing off with 2009 Mayoral Candidate and South District Councilman Mickey Kearns. Demone was elected to the County Legislature in 2004 and moved over to the Buffalo Common Council in 2008 to fill the vacancy to replace Antoine Thompson after he won a special election in Mayor Byron Brown’s old Senate district. It’s a Grassroots bonanza as members of the organization have climbed the ladder of electoral success. According to his official city biography, Demone has been active in his community. “Smith has been active in the education, civic responsibility and political awareness of his generation, as well as older and younger generations in the City of Buffalo, Erie County and the State of New York. He also would like to note that since he was first elected to public office, he has established himself as willing to go beyond what is required for success. I’m not sure how that’s measured, but we’ll go with it. He’s a prototypical party apparatchik working on behalf of the Mayor in the Common Council. That video pretty much sums it up. Smith’s opponent, Mickey Kearns was most recently a candidate for Mayor of Buffalo in 2009 and is now the proud owner of the South Buffalo committee structure, which has grown his power and leverage in the city. His first opportunity to flex his newfound power will be this summer when he chooses his horse in the NY State Senate election contest between Tim Kennedy, Bill Stachhowski and Sean Cooney. His support and committee loyalists will be a major factor in that race. 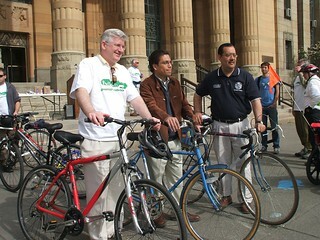 Mickey was first elected to the Buffalo Common Council in 2006 after serving as a legislative aide to former South District Councilman Dennis Manley and some work in the private sector as a non-profit fundraiser. Kearns opportunistically staked out some territory as an opponent of the Route 5 highway construction project on Buffalo’s Outer Harbor. From that point, Mickey was essentially running for Mayor and launched one of the most quixotic runs for that office in recent memory. His campaign started out as listless and seemed to lack an agenda that differed significantly from Mayor Brown’s agenda. His earlier opposition to the Route 5 project also destroyed any chance he had of enlisting necessary support from Rep. Brian Higgins, King Of The Waterfront. He’s no dummy, but not the sharpest knife in the drawer, either. In short, Kearns has shown some progressive sensibilities and comes across as an accessible, decent sort. But he’s still pretty green and largely untested. His lackluster campaign for mayor this year is not reassuring. What voters are left with is a choice between a middling councilman and a middling mayor. Mickey has shown a willingness to learn, but he’s just the same old, same old. A transactional politician in a city that desperately needs big thinkers. He has demonstrated an ability to pay his taxes on time and not get arrested or even charged with a felony, so he has that going for him, which is nice.